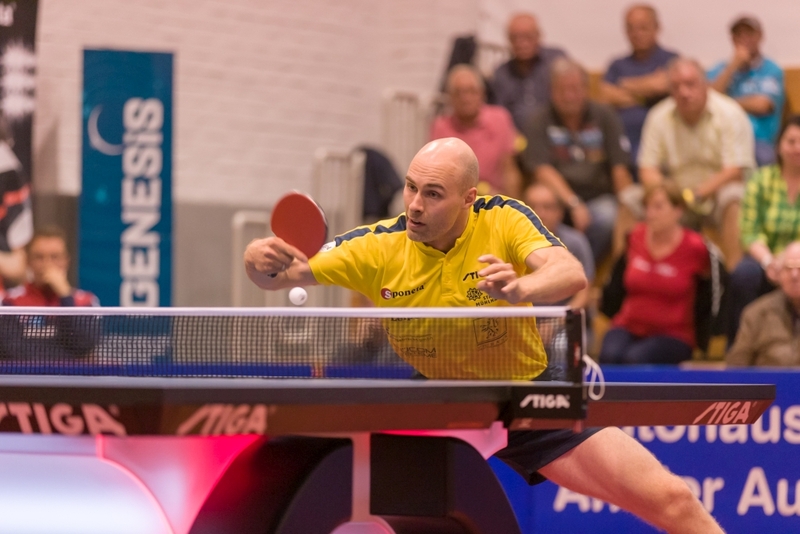 Thanks to a 3-1 win against TTC Schwalbe Bergneustadt on matchday 5 of the Tischtennis Bundesliga (TTBL), TTF Liebherr Ochsenhausen still closely follow leader Borussia Düsseldorf. The record champion, however, has no problems against promoted TTC indeland Jülich – even without Timo Boll. Post SV Mühlhausen and TTC RhönSprudel Fulda-Maberzell win clearly, 1. FC Saarbrücken TT, however, struggle. TTF Liebherr Ochsenhausen remain the first pursuer of front runner Düsseldorf. The Upper Swabians won the direct duel for second place against TTC Schwalbe Bergneustadt confidently 3-1 on matchday 5 of the Tischtennis Bundesliga (TTBL). Dmitrij Mazunov's team had a false start, though, when Paul Drinkhall beat Hugo Calderano in five sets. "Hugo had some problems in the first match because he was lacking match practice compared to the guys who played the European Championships," said Mazunov. "Nevertheless, he fought commendably and did a heck of a job in the second singles." There, Calderano scored the decider against Benedikt Duda in an impressive manner (3-0). Before that, Stefan Fegerl had brought the first defeat of the evening to European Championships quarter-finalist Duda and Jakub Dyjas raised it to 2-1 against Vladimir Sidorenko soon after. "With Benne, I realized that after the European Championships before which he trained a lot, and yesterday's cup match, it's just not his day," said Schwalbe coach Yang Lei of his protégé, who has been unbeaten to date. "But we still had our chances today, especially after the sensational victory of Paul against Calderano." While Bergneustadt lose ground in the table for the time being, Ochsenhausen are only lacking two points to the first place. Borussia Düsseldorf won clearly against bottom-placed TTC indeland Jülich and thus still remain unbeaten in the fifth match of the season. Kamal Achanta, who after a year in Bergneustadt celebrated his comeback in the jersey of the record champion, paved the way for the clear 3-0 victory in the ARAG CenterCourt and left German national Dennis Klein chanceless. "It's fantastic to be back in a home match for Borussia and play in front of the great crowd. I'm overjoyed to be back," the 36-year-old Indian said. Finally, Kristian Karlsson secured the win after about 100 minutes, after his Swedish compatriot Anton Källberg had increased the lead to 2-0 against Robin Devos before the break. However, Jülich's number one was not entirely dissatisfied at the end: "Against Källberg, another result would have been possible for me. Overall, despite the defeat, we were able to show that we belong in the Bundesliga." Post SV Mühlhausen once again showed that they do not just belong to the TTBL. Two days after the courageous Champions League debut in Russia, the team of coach Erik Schreyer surprisingly defeated SV Werder Bremen 3-0. However, the result does not reflect the course of the match. "That was a very close match, although we lost 0-3," said Werder coach Cristian Tamas. "The sticking point for me was the first singles, in which Basti (Steger) has led 2-0." This lead, however, was first equalized and later turned around by brave-fighting Lubomir Jancarik. Daniel Habesohn then increased against Hunor Szöcs to 2-0, before it got close once again after the break – and a Mühlhausen player was able to turn the tables again. Gustavo Tsuboi led 2-1 against Steffen Mengel, in the end, however, Mengel won. "Unfortunately, Ovi (Ionescu) was missing today, so we did not think we could win that clearly here in Bremen. But we all played well, which was surprising considering our condition (after the European Championships and the trip to Russia)," said Habesohn. The clear victory of TTC RhönSprudel Fulda-Maberzell against a particularly in the first two singles strikingly chanceless ASV Grünwettersbach was suprising as well. "We are very happy with the match," said Ruwen Filus, who sealed the 3-0 victory of the East Hessians with the only narrow victory of the afternoon. Previously, Wang Xi prevailed in three games against Bojan Tokic just as Tomislav Pucar did in a duel with Ricardo Walther. "Especially Tomislav could convince today," praised his teammate Filus. "You have to make it 3-0 against Ric first. I was able to hold the pressure up high after him and narrowly prevailed against Dang Qiu, so that we had a perfect start into the Bundesliga after the break." The guests from Karlsruhe have to accept the next setback three weeks after their first success of the season and remain winless against Fulda. At the end of the day, TSV Bad Königshofen remained without any points, too. However, the hosts from Lower Franconia gave 1. 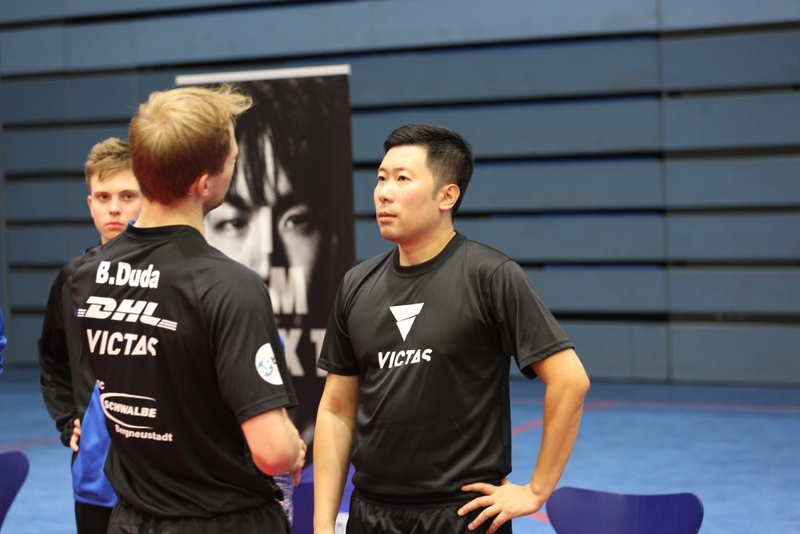 FC Saarbrücken TT a good fight, which was mainly due to one player: The Japanese Mizuki Oikawa won both the opening match against new signing Liao Cheng-Ting, who made his debut in the FCS jersey, as well as the top singles against Patrick Franziska. The latter was impressed: "Oikawa got a superb day today. You just have to accept that he has simply played very, very well." Previously, Franziska himself had equalized the Oikawa lead against Filip Zeljko, Darko Jorgic against Bence Majoros turned around the match into Saarbrückens favor. "That was the sticking point of the match. The singles was on a knife edge, both could have won it," Franziska said. "That's why we're happy that we can take the two points at the end." Jorgic and Liao finally picked up the crucial point in the deciding doubles.